This article is about the men's team. For the women's team, see Tunisia women's national football team. The Tunisia national football team (Arabic: منتخب تونس لكرة القدم‎, French: Équipe de Tunisie de football), is the national team representing Tunisia in association football since their maiden match in 1957. The squad is under the global jurisdiction of FIFA and is governed in Africa by CAF. It is governed by the Tunisian Football Federation , founded in 1957 after the Tunisian independence in 1956. Tunisia are colloquially known as Les Aigles de Carthage (The Eagles of Carthage). The team's colours are red and white, and the Bald eagle its symbol. Periods of regular Tunisian representation at the highest international level, from 1962 to 1978, from 1994 to 2008 and again from 2014 onwards. Most of Tunisia's home matches are played at the Stade Olympique de Radès in Radès since 2001. Tunisia's national team have participated in three quadrennial major football competitions. It appeared in the end stages of five FIFA World Cups and eighteen Africa Cup of Nations, and featured at four Olympic football tournaments. Nevertheless, they created history in that 1978 tournament in Argentina by becoming the first African side to win a World Cup match, beating Mexico 3–1. They also held defending champions West Germany to a goalless draw before bowing out. They have since qualified for three tournaments in succession, in 1998, 2002 and 2006 before returning in the last edition held in Russia in 2018; however in spite of this rich record, Tunisia had never been able to progress out the group stage in any FIFA World Cup or Summer Olympics tournaments. Tunisia has long-standing football rivalries with North African teams: Egypt, Morocco and Algeria. In fact, the Tunisian team has always met with them, whether through friendly matches or World Cup qualifiers and the African Cup of Nations. Tunisia is one of the most successful African national teams in competitions, having won one African Cup of Nations, as tournament hosts in 2004. They have also been runners-up twice in 1965 as hosts and 1996 held in South Africa. The Tunisian football team in 1939. Before independence, an unofficial team was formed in 1928, comprising the best Tunisian players from the Tunisian League. The team's first match was on 11 March 1928, against the France national football B team; Tunisia lost 8-2. Their next friendlies, against the same team on 23 March 1930 and 26 March 1933, also resulted in heavy defeats: 0-5 and 1-6 respectively. Tunisia had to wait until 1939 for their first match win: a 4-1 victory over a team of amateur footballers of Paris. Dara (Sporting Club Tunis): 11 caps. Tunisia gained independence from France on 20 March 1956. The Tunisian Football Federation was founded on 29 March 1957 and became affiliated to FIFA and the Confederation of African Football in 1960. The independent Tunisia played their first match against Algeria on 1 June 1957, in the midst of the Algerian War; Tunisia lost 2-1.They played their first official match at the 1957 Pan Arab Games where they won the silver medal. Tunisia qualified for 1960 Summer Olympics which was their first international event; on 24 July 1960, the team experienced its biggest-ever defeat, losing 10-1 against Hungary. However, less than a month later, on 18 August 1960, Tunisia recorded their biggest-ever win: an 8-1 thumping of Taiwan. Habib Bourguiba, President of the Republic, amid the Tunisian side that won the Palestine Cup in 1973. In 1962, Tunisia entered the African Cup of Nations qualifiers for the first time: the team successfully qualified for the tournament and went on to finish third. Three years later, Tunisia hosted the 1965 African Cup of Nations and reached the final, where they lost 3-2 to Ghana in extra-time. Despite this early success, Tunisia did not enter the Cup of Nations again until 1976, and did not qualify for one until 1978. In 1973, however, the team entered the Palestine Cup of Nations and won in dominant fashion, winning all six of their matches, scoring 19 goals, and conceding only three. Tunisia in 1978 World Cup. In 1977, under new coach Abdelmajid Chetali, Tunisia qualified for the 1978 African Cup of Nations and, at the same time, their first-ever World Cup. Tunisia made the semi-finals at the Cup of Nations, beating holders Morocco along the way, but lost to Ghana in the semi-finals. In the third-place match against Nigeria, Tunisia initially took the lead, but when Nigeria scored a controversial equalizer in the 42nd minute, the Tunisians walked off the pitch in protest and Nigeria were awarded a 2-0 victory by default. At the World Cup in Argentina, Tunisia made an immediate impact by coming from behind to beat Mexico 3-1, becoming the first African team to win a World Cup finals match. A few days later, the team held reigning champions West Germany to a 0-0 draw. Despite these impressive results, however, a 0-1 defeat to Poland in their final group match meant they were eliminated in the group stages. Following their first experience of World Cup football, Tunisia experienced a sudden decline. Between 1980 and 1992, the team managed to qualify for only two tournaments - the 1982 African Cup of Nations and the 1988 Summer Olympics - and in both they were knocked out in the first round. In fact, Tunisia qualified for the African Cup hosted by neighbor Libya and achieved negative results: drawed with Cameroon in the first game before being defeated against Libya and Ghana to withdraw by only one point. They qualified also for the Olympic Games after surpassing Morocco and Egypt in the qualifiers with coach Taoufik Ben Othman but he was sacked days before the start of the competition and was replaced by Antoni Piechniczek. The results were not good after drawing with China and Sweden and a heavy defeat from West Germany 1-4. Tunisia managed to break the streak in 1994 by hosting that year's African Cup of Nations replacing original hosts Zaire, but the result was catastrophic and unexpected with a defeat by Mali 2-0 in the opening game at El Menzah Stadium, which contributed to the dismissal of Youssef Zouaoui after the opening match and compensated by Faouzi Benzarti, who drawed with Zaire in the second game finishing bottom of the group. Henryk Kasperczak who guided the team to qualify for the 1998 World Cup after 20 years. After the team's poor performance at the 1994 African Cup of Nations, a new coach was appointed: Henryk Kasperczak. Under him, Tunisia qualified for 1996 African Cup of Nations and finished second in their group, putting them through to the quarter-finals. Tunisia went on to beat Gabon in the quarter-finals and Zambia in the semi-finals to reach their first major final in 31 years, but lost to host country South Africa 2-0. Still under the leadership of Kasperczak, Tunisia reached the quarter-finals of the 1998 African Cup of Nations, where they were eliminated in a penalty shootout by host country Burkina Faso. The team also qualified for that year's World Cup after a 20-year absence: they again failed to advance from the group stages, losing 2-0 to England and 1-0 to Colombia, and drawing 1-1 with Romania. Kasperczak was sacked and replaced with Francesco Scoglio, who guided the team to the 2000 African Cup of Nations, where they finished in fourth place after losing to Cameroon in the semi-finals. The following year, Scoglio departed to rejoin Genoa CFC, sparking a period of severe instability. Eckhard Krautzun initially took over and guided the team to a second successive World Cup qualification, but then resigned, citing interference from the Tunisian FA with his coaching. Henri Michel replaced him, but was sacked when Tunisia crashed out of the 2002 African Cup of Nations without scoring a single goal. Finally, Ammar Souayah took over in time for the 2002 World Cup; Tunisia could not better their 1998 performance, drawing 1-1 with Belgium but losing 2-0 to Russia and co-hosts Japan. Roger Lemerre, the most successful manager in Tunisia. He guided his team to win the AFCON 2004. After the 2002 World Cup, former France manager Roger Lemerre took over, becoming Tunisia's fifth manager in less than two years. As well as steadying the ship, Lemerre was tasking with winning the 2004 African Cup of Nations, which Tunisia would be hosting. During the build-up to the tournament, the team established themselves as favourites with several impressive friendly results, holding France and Portugal to 1-1 draws and beating Sweden 2-1. Tunisia-Ukraine match during 2006 FIFA World Cup. Tunisia advanced unbeaten from the group stage, beating Rwanda 2-1 and DR Congo 3-0, and drawing 1-1 with Guinea. The team then beat Senegal 1-0 and Nigeria on penalties to face Morocco in the final, where goals from Francileudo Santos and Ziad Jaziri gave Tunisia a 2-1 win. Lemerre became the first coach to win two different continental tournaments, having previously won Euro 2000 with France. The victory gave birth to the Tunisian team's present nickname, the "Eagles of Carthage", and accordingly, the team's badge was changed to its current design, which incorporates an eagle. African Cup of Nations win qualified them for the 2005 Confederations Cup, where they were eliminated in the group stage despite beating Australia, having already lost 2-1 to Argentina and 3-0 to hosts Germany. The following year, they failed to defend their Cup of Nations title, losing to Nigeria in the quarter-finals, but did at least qualify for a third successive World Cup. Once again, however, they could not progress from their group, drawing 2-2 with Saudi Arabia but losing 3-1 to Spain and 1-0 to Ukraine. In the 2008 Africa Cup of Nations, the team were again knocked out in the quarter-finals, this time losing 3-2 to Cameroon. On 30 June 2008, Roger Lemerre left Tunisia after six years, the longest reign of any of the team's coaches. He was replaced by Portuguese coach Humberto Coelho. Tunisia-Mozambique on 6 June 2009 for 2010 FIFA World Cup qualification. Under Coelho, Tunisia failed to qualify for the World Cup and ended the country's streak of three consecutive presences in the tournament, after losing their final qualifying match to Mozambique. Coelho was sacked immediately after this defeat and Faouzi Benzarti took over; he too was sacked after Tunisia were eliminated from the 2010 Africa Cup of Nations in the group stage, drawing all three of their matches against Gabon, Cameroon, and Zambia finishing in the bottom of the group. Tunisian fans supporting the national team. In June 2010, Bertrand Marchand was appointed manager on a two-year contract, with the goal of reaching the semifinals of the 2012 Africa Cup of Nations. However, qualification started badly, with two defeats against Botswana and a 2-2 draw against Malawi. Marchand was sacked in December, only six months into his two-year term. The beginning of 2011 saw the Tunisian Revolution. Against this turbulent backdrop, and with little preparation under new coach Sami Trabelsi, the team surprisingly won the 2011 African Nations Championship, defeating Angola 3-0 in the final. Tunisia went on to qualify for the 2012 African Cup of Nations, but an extra-time defeat to Ghana knocked them out in the quarter-finals yet again. Tunisia fared even worse in the following tournament, falling in the group stages despite a 1-0 win over Algeria in which Youssef Msakni scored what was later voted the goal of the tournament. In February 2013, Sami Trabelsi was replaced by Nabil Maâloul. Under Maâloul, Tunisia initially failed to make the World Cup qualification playoffs after a 2-0 defeat to Cape Verde national football team, but Cape Verde were found to have fielded an ineligible player and Tunisia were awarded a 3-0 victory, putting them through to the playoffs. With Maâloul having already resigned, Ruud Krol took over for the two-leg playoff, but Tunisia lost 4-1 to Cameroon and Krol himself then resigned. Tunisia national team at the 2018 FIFA World Cup in Russia. Georges Leekens was appointed coach in early 2014 to try and revive the team's fortunes. Early results were positive, including a (1-1) draw against Colombia and a 1-0 win over South Korea, both in friendly matches. Under Leekens, the team climbed from 49th to 22nd in few months in the FIFA rankings so the team regained its continental luster. Tunisia qualified for the 2015 African Cup of Nations and finished top of their group, but were eliminated in the quarter-finals after a controversial 2-1 defeat to Equatorial Guinea. In July 2015, Henryk Kasperczak returned as coach after 17 years, but was sacked after yet another quarter-final defeat at the 2017 Africa Cup of Nations, this time 2-0 against Burkina Faso despite the good start in the World Cup qualification. On 27 April 2017, Nabil Maâloul returned as coach and succeeded in bringing his team back to the 2018 FIFA World Cup for the first time since 2006. Tunisia's qualification for the 2018 FIFA World Cup and its positive results in the friendlies against Iran and Costa Rica led to its rise to 14th place in the FIFA World Rankings for the first time ever, after being first in African teams and surpassing teams like Italy and Netherlands. In the World Cup, the team was eliminated from the group stage after losing 2-1 against England and 5-2 against Belgium, before winning the last game 2-1 against Panama, the first World Cup win for Tunisia since beating Mexico 3-1 in 1978. The Stade 7 November in Radès the home stadium of Tunisia national team. After the independence of Tunisia in 1956, the Tunisian national stadium was Stade Chedly Zouiten which has a capacity of 18,000 and hosted all the matches of the Tunisian team, it hosted also the 1965, 1994 African Cup of Nations and the 1977 FIFA World Youth Championship before it was replaced after the construction of Stade El Menzah (45,000) in 1967 for the 1967 Mediterranean Games. Tunisia's first match at the stadium was played on 8 September 1967 against Libya. Tunisia won the match 3–0. This stadium became the new stronghold of the Eagles of Carthage. It hosted the 1977 FIFA World Youth Championship and was completely renovated for the 1994 African Cup of Nations. It hosted also the 2004 Africa Cup of Nations. In 2001, the Stade Olympique de Radès was inaugurated as Tunisia's national stadium ahead of the 2001 Mediterranean Games. Located in Radès, the stadium has an all-seater capacity of 60,000. The first match at the stadium was played on 7 July 2001 against between Étoile du Sahel and CS Hammam-Lif for the Tunisian Cup final. CS Hammam-Lif won the match 1–0, with Anis Ben Chouikha scoring the lone goal. Since that match, Tunisia has used the stadium for almost every major home game, including the 2004 African Cup of Nations Final. The Tunisians often hosts their matches in Stade Mustapha Ben Jannet in Monastir which has a capacity of 20,000 for its excellent ground, whether in the African Cup of Nations qualification, World Cup qualification or friendly matches. 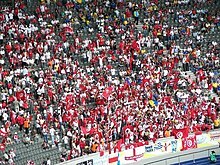 Fans watching the Tunisia-Ukraine match at the 2006 World Cup in Stuttgart. Fans of the Tunisian national team display the country's national flag, usually with an emphasis on the red element .One of the greatest moments for the Tunisian team when the Tunisian delegation at the Tunis–Carthage International Airport received a warm "welcome home" after the 1978 epic that delighted the Tunisians, who still remember the details, and the brilliant performance of the team was credited with adding a new seat to Africa in the World Cup. The team's popularity also appeared in the 2004 African Cup of Nations in Tunisia, where the crowds were heavily attended during that period. The Stade Olympique de Radès of Radès was filled with 60,000 spectators in the six matches of the tournament. The team's deterioration after the 2006 World Cup lead to their absence from the end stages of the next two world cups, and strained their popularity. In fact, the stadiums were almost empty with the national team's matches in that period. Between 2008 and 2014, local journalists accused the Tunisian team for their poor performance. The emergence of skilled players and the rise of a new promising generation in addition to good results in the second tirm of Henryk Kasperczak, increased fans' enthusiasm and belief in a successful World Cup campaign.Because of this popularity peak, the FIFA has named the Tunisian fans among the best in the 2018 FIFA World Cup. This choice comes after the great attendance of the Tunisian masses, which turned to Russia in large numbers between 15 and 20 thousand fans, attended and supported the Tunisian team in the three matches of the World Cup. Tunisia's main football rivals are its neighbours Algeria, Libya, Morocco and Egypt, with which it shares close cultural and political relations. Tunisia-Algeria match in the 2013 African Cup won by Tunisia 1–0. Tunisia played until today 43 games against Algeria. The first match took place on 1 June 1957 in a friendly match against the FLN football team when Algeria was a French colony. It was at this time that the matches were the most regular. Indeed, the two teams met six times, between June 1957 and May 1958, with eight victories for the Algerians. 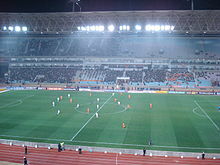 After the independence of Algeria, the first official match took place on 15 December 1963, in a friendly match at the Stade Chedly Zouiten in Tunisia. The teams also met three times in the qualifying phase of the World Cup in 1970, 1978 and 1986. The overall record is slightly favorable to the Algerians with fifteen wins, fourteen draws and fourteen losses. The last defeat of Algeria against their neighbors dated back to 20 January 2017 during the 2017 Africa Cup of Nations which was hosted by Gabon. Before this match, the two teams had met once in the African Cup of Nations finals in 2013, which was also dominated by the Tunisians. Tunisia-Morocco in a friendly match on 5 June 2010 in Casablanca. Tunisians and Moroccans have played 50 games since their independence from France in 1956. Their first match was for the 1962 World Cup qualification, took place on 30 October 1960 in Casablanca. Most of the matches were played in the FIFA World Cup qualification as they met in the qualifiers of 1962, 1970, 1978, 1990, 1994 and 2006. They also met 4 times in the African Cup of Nations. Two of them ended in a draw in 1978 and 2000 and the other two matches with the victory of the Tunisian team in 2004 and 2012 Africa Cup of Nations. In fact, their most important match was the 2004 African Cup of Nations Final in Stade 7 November in Tunisia, where the Tunisians won their first African title. The overall record is favorable to the Moroccans with 13 wins, 28 draws and 9 losses. The last match between the Maghrebian teams dated back to 28 March 2017 during a friendly match won by Morocco in Marrakech which contributed to the dismissal of the Tunisian coach Henryk Kasperczak. The two teams are similar in terms of both having a single African Cup and the two teams have also qualified for five World Cups, despite their numerous World Cup qualifying matches. They qualified for the same tournament in 1998 in France and 2018 in Russia. The match between the Egyptian and the Tunisian team are one of Africa's best and most exciting matches for their long continental history. The two teams have met 39 times in both official and friendly matches. Tunisian and Egyptian teams have collected 25 official matches and 14 friendly matches. The overall record is clearly favorable to the Tunisians as they won 16 matches and Egypt won 12 matches and ended 11 matches with a draw. Tunisia-Egypt in a friendly match in October 2012 in Abu Dhabi. The Eagles scored 42 goals in the Pharaohs' goal, while Egypt scored only 35 goals against Tunisia. The largest goal scoring match was on 11 December 1977 for the 1978 FIFA World Cup qualification (CAF) after the great win of the Tunisians 4–1 which contributed in their qualification for the World Cup. Tunisia have faced the Egyptian team 7 times in qualifying for either the World Cup or the African Nations Cup. The three World Cup qualification were in 1974, 1978 and 1998 where Tunisia qualified in the last two editions against Egypt. The four qualifiers for the African Nations Cup were in 1978 (Tunisia won 3–2 after drawed in 2–2), 1984 (0–0 draw in Tunis and the Pharaohs won in Cairo 1–0), 1992 (the teams drew 2–2 twice) and 2015 (Tunisia won 1–0 and 2–1 respectively), in addition to the current 2019 qualifiers for the fifth time, which Tunisia won the first game 1–0 in Radès and lost the second game in Alexandria 2–3. The two teams met twice in the African Nations Cup finals in 2000 in Nigeria when Tunisia won 1-0 and in the next edition in 2002 in Mali when Egypt won with the same result. Hossam Hassan is the most Egyptian player participating in the games of the Pharaohs against the Eagles of Carthage with 12 games, while Wahbi Khazri comes as the most Tunisian players to participate in their matches against Egypt by 3 games. A Tunisair plane supporting the Eagles in the 2006 World Cup. Alain Giresse, the current manager of the Tunisia national team. This is a list of matches from the last twelve months and any future scheduled matches. The following players were called up for the 2019 Africa Cup of Nations qualification match against Eswatini on 22 March and the friendly match against Algeria on 26 March 2019. Caps and goals updated as of 26 March 2019 after the match against Algeria. Only official FIFA matches are included. Sadok Sassi is the most capped player in the history of Tunisia with 116 caps. Wahbi Khazri is the top scorer among active players with 14 goals. ^ a b Imed Kilani. "Tunisia – Record International Players". RSSSF. Retrieved 16 August 2013. Wikimedia Commons has media related to Tunisia national football team.